Special Thanks: A copy of this Leaving Cert Applied Maths Higher Level 1971 exam was kindly provided by Noel Cunningham. a) Explain how a graph of velocity plotted against time can be used to calculate acceleration and distance travelled, with particular reference to motion with constant acceleration. A particle is projected from a point on a plane inclined at to the horizontal with a velocity metres/second where is a unit vector through pointing upward along the line of greatest slope in the plane and is a unit vector perpendicular to the plane. iii) and find the velocity of the particle when it strikes the plane. Two smooth spheres and of equal radii but of masses kg and kg respectively collide on a smooth horizontal table. Before collision the velocity of is m/s and the velocity of is m/s where and are unit perpendicular vectors in the plane of the table and lies along the line of centres at impact. If the collision is perfectly elastic find the velocity of and the velocity of immediately afterwards. A light inextensible string which is fastened at one end to a point in the ceiling passes under a smooth movable pulley of mass kg, then over a smooth fixed pulley , and a particle of mass kg hangs freely from its other side. 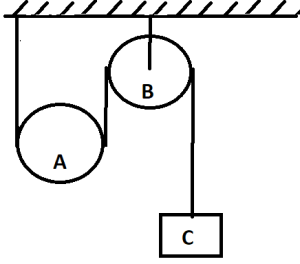 All parts of the string which are not touching the pulleys are vertical. i) When the system is released from rest show that the acceleration of the particle is m/s and that the acceleration of the pulley is half this. ii) Find also the tension in the string. a) Define simple harmonic motion in a straight line and show it can be described by the differential equation . Prove that , where is a constant, is a solution of this equation. b) A particle describing simple harmonic motion on a straight line has velocities m/s and m/s when at a distance of m and m respectively from the centre of oscillation. i) Find the amplitude and periodic time of the motion. ii) Calculate the least time taken for the particle to travel from the position of rest to the point where the velocity was m/s. a) i) Show that , where , are constants and , are constant unit perpendicular vectors, is the position vector at time of a particle moving in a circle. ii) Show that the velocity is of magnitude and is at right angles to . iii) Prove that the acceleration is of magnitude and acts towards the centre of the circle. (ii) the tension of the string. a) Two rods , , of equal lengths but of weights and , respectively, are freely hinged together at . They stand in equilibrium in a vertical plane with the ends and on a rough horizontal plane with the angle equal to . i) Show that the vertical components of the action of the plane at and are and respectively. ii) Show in a separate diagram the forces acting on each rod, using vertical and horizontal components for the reaction at . Find all these forces and prove that if one rod is on the point of slipping, the coefficient of friction is . i) Prove that the moment of inertia of a uniform circular lamina of mass and radius about an axis through its centre , perpendicular to the plane of the lamina, is . ii) Deduce that the moment of inertia about a parallel axis through a point of the circumference is . iii) Such a lamina is free to rotate in a vertical plane about a horizontal axis perpendicular to its plane through a point on its circumference. It is released from rest with horizontal. Find the angular velocity of the lamina where makes an angle with the download vertical, show that the speed of at its lower point is . a ) State Archimedes Principle for a body immersed in a liquid. b) A uniform rod in equilibrium is inclined to the vertical with one quarter of its length immersed under water and its upper end supported by a vertical force . i) Show that in a diagram the three force acting on the rod, and prove that the specific gravity of the rod is . ii) Express in terms of , the weight of the rod. A particle of mass is projected with speed along a smooth horizontal table. The air resistance to motion when the speed of the particle is , is where is a constant. ii) prove that as time increases indefinitely, the distance travelled ultimately approaches . iii) Find the time taken for the particle to travel half this distance.